These are some of my better writings. For a more comprehensive list of publications, see my university profile here. You can also read some of my papers on my academia.edu profile here. In this chapter, I explore how urban histories of violence are reflected in language, whether in piercing words and clear images or in distorted allegories and muted allusions. Drawing on examples of methodological issues from the case studies presented in the edited volume, I look into the intersection between the semantic categories of ‘space’ and ‘violence’. I discuss the fluid and sometimes controversial boundaries between vocabularies employed in historical sources and in historical research respectively; between language about violence and language as violence; and between the numerous languages in which the historians in this volume have conducted their research. Simplistic representations of the intercommunal violence during the 1946 oil strike in Abadan, as rooted in either primordial ethnic hatred or in an imperialist plot, are taken to task. I carefully reconstruct several days of clashes within a historical context of coercive industrial urban development, labor activism, ethnic mobilization and global politics. Using oil company records, national archives and personal accounts, I focus on the socio-spatial unit of the club as a place for socialization, a site of strife in the urban life of an oil city, and a key political space with significance in the evolution of the modern Iranian nation-state. ‘Talking Class in Tehroon’ with Khodadad Rezakhani in Middle East Report, Vol. 45, Winter 2015: 6-9. A brief article on how blatant and subtle references, metaphors, idioms and slang is used to identify class and status in both everyday Persian and official discourse. Read here: Talking Class in Tehroon _ RasmusElling KhodadadRezakhani _ MER277. ‘Tribal Hands and Ethnic Votes: Regionalism, Securitization and Minorities in Iran’ in Ethnic and Racial Studies, Vol. 38, No. 14 (2015). Ethnic politics is a serious domestic challenge in Iran. Non-Persian communities are mobilizing to claim their rights and to demand representation in a system that activists claim is biased against minorities and the peripheral regions. Yet the inner workings of contemporary Iranian ethnic politics are largely understudied. This article explores recent evolutions in the role that ethnicity, regionalism and tribalism plays in Iranian domestic politics. 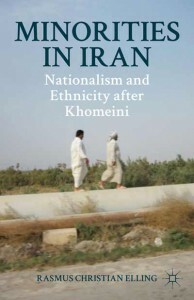 It focuses on how these interconnected factors figured in the 2013 presidential and local council elections in Iran in a particular province that has a history of ethnic tensions. Incidentally, these elections brought Hassan Rouhani, a moderate cleric, to power as president. Among his electoral promises was to end the securitization of the minority issue. This article illustrates some of the barriers to a transformative ethnic politics – barriers that political leaders will have to overcome to enact real change. ‘Ethnic Minorities and the Politics of Identity in Iran’ with Alam Saleh in Iranian Studies, Vol. 48, No. 6: 159-171. A review essay of a novel format: I review the recent work of Alam Saleh, Lecturer in Middle Eastern Politics, University of Exeter, and he reviews my book on minorities in Iran – and then we pose a number of critical questions to each other in order to discuss the issue of ethnic minorities, identity and nationalism in post-revolution Iran – and how to study these issues. Read more. ‘Oliebyen midt i en jazztid: Nostalgi og modernitet i Abadan’ in Tidsskriftet Kulturstudier, Nr. 2 (2014). Based on interviews in Abadan and readings of local histories and memoirs, I explore how Abadanis today express a nostalgia for the glory days of the oil city. I argue that oil has shaped social and cultural life in the city to the extent that it is internalized in the local Abadani identity – and expressed through a bitter-sweet nostalgia for the missed futures of the past that the unfulfilled promises of the “magic” of oil has left behind. As you might have guessed, this one is in Danish. I am, however, translating and converting it into a three-part essay in English (with many images), which will be published online soon. ‘On Lines and Fences: Labour, Community and Violence in an Oil City’ in U. Freitag, N. Fuccaro, C. Ghrawi, N. Lafi (Eds. ): Urban Violence in the Middle East: Changing Cityscapes in the Transition from Empire to Nation-State (Berghahn Publishers, forthcoming 2015). Here, I use oil company archives to reveal an alternative labour history of Abadan in which the oil city is understood to have multiple subaltern agencies, making violence operate on several levels at the same time. I question the notion so often reiterated uncritically in Iranian and Middle East studies of ‘the British’ as a single, cohesive actor, and instead show how the government, the military and the Anglo-Iranian Oil Company often were at odds with each other. I do this by focusing on how an episode of violence between Iranians and Indian migrant workers in Abadan during World War II was treated by the involved actors – and how the urban micro-level connected to the global macro-level. ‘The World’s Biggest Refinery and the Second World War: Khuzestan, Oil and Security’ (paper presented at International Conference on the Comparative Social Histories of Labour in the Oil Industry, Amsterdam, 13-16 June 2013, organized by The International Institute of Social History). This is an on-going work of which you can read an abstract here. The final product will probably become part of my next book on Abadan’s social history. In the paper, I explore the understudied topic of labour discontent and security politics in World War II Abadan. I am particularly interested in the extent to which Company demands and measures for increased security to protect its human and material assets in Khuzestan were in fact pretexts for increased control with the labour force. I look into a largely overlooked event in the history of oil labour in Iran: the strike by British workers in 1943. ‘Matters of Authenticity: Nationalism, Islam and Ethnic Diversity in the Islamic Republic of Iran’ in N. Nabavi: Iran: From Theocracy to the Green Movement (Palgrave Macmillan 2012). I analyze the interrelated issues of nationalism, Islamism and identity in Iran today, focusing on the conflicting representations of ethnic diversity in the contemporary official regime-sanctioned literature. The inherent contention is evident in Iranian public debate, in state rhetoric, and in opposition discourses. The secular and liberal nationalist opposition continuously challenge the regime’s legitimacy by accusing it of sacrificing Iran’s national interests on the Islamist altar. The regime responds with the argument that Islam is key to Iran’s national identity. At the same time, the question of “Iranian-ness” has been further complicated since the late 1990s by growing ethnically framed mobilization and a budding movement for minority rights. ‘Bring in the Dead: Martyr Burials and Election Politics in Iran’ on Middle East Report Online, March 19, 2009. Just before the Green Movement took to the streets in Iran, I did this piece on the pro-democratic Iranian student movement’s protests against the burial on campus of martyrs from the Iran-Iraq War. I look into the history of martyr burials and argue that the episode reflects deep tensions in Iranian society and politics. ‘State of Mind, State of Order: Reactions to Ethnic Unrest in the Islamic Republic of Iran’ in Studies in Ethnicity and Nationalism, Vol. 8, No. 3 (2008). In my first peer-reviewed international article, I analyze the official reactions to ethnic unrest in Khuzestan and Azerbaijan in 2005-6 in order to flesh out some observations of changes not only in the official ideology of the regime, but also in national identity discourses in society more broadly. I reviewed an excellent new dissertation on Iranian reformists and the Islamic intellectuals who inspired them. Charles Tripp: The Power and the People: Paths of Resistance in the Middle East (Cambridge University Press, 2013) – reviewed in Middle East Journal of Culture and Communication, Volume 7, Issue 3, pages 377 – 379 (2014). It was a humbling experience to review the work of such a towering figure in Middle East studies! ‘All Eyes on Iran: the Nuclear Ambitions of a People and a President’ in Intelligence and National Security, Vol. 24, No. 5. I review five books on the Iran-related topics that was on all Western minds at that time: Ahmadinejad and the nuclear program.